Anthuriums are cheery, exotic flowering houseplants that offer glossy, green heart-shaped leaves topped by heart-shaped pink, red, or white long-lasting blooms. Happily, anthuriums bloom almost all year long if they get enough light, fertilizer, and moisture. The brightly colored flowers make anthuriums perfect plants for centerpieces and tabletops. They grow well on their own or mix them with other bold tropicals such as red aglaonema for a knock-out look. Accent their colorful flowers with bold pots; for example, red-flowering anthuriums are stunning in red, white, or black ceramic pots for a classic look. 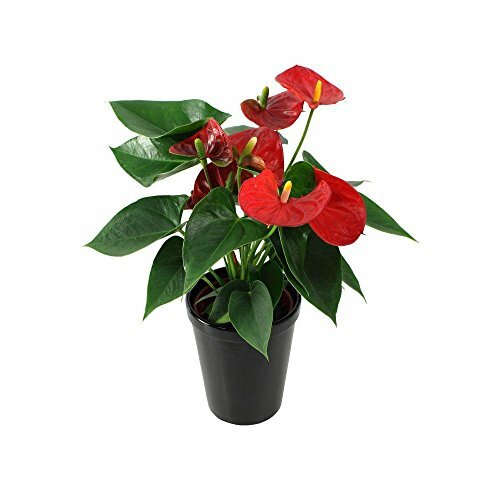 Note: Anthurium is a natural air purifier! It's been scientifically proven to scrub harmful chemicals and indoor air pollution from homes and offices.